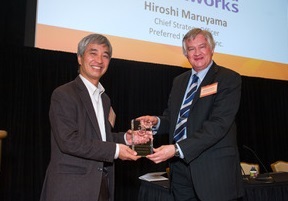 Receiving 2017 Emerging Leader Award (Japan) with Dr. Richard Dasher, Director, Stanford US-Asia Technology Management Center and Hiroshi Maruyama, Chief strategy officer of PFN. 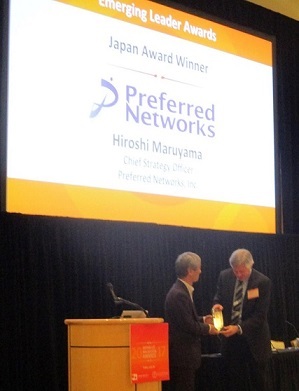 Preferred Networks, Inc. was selected as the “2017 Emerging Leader Award”, the winner of the 2017 Japan-U.S. Innovation Award held at Stanford University on Friday, July 28th. PFN was one of the “Innovation ShowCase” start-up companies in 2016, and the rapid growth in the past year was highly appreciated. US-Japan Innovation Awards is operated by the Japan Society of Northern California in collaboration with the Stanford University US–Asia Technology Management Center. “Emerging Leader Awards” are presented to young, dynamic, and growing, entrepreneurial companies founded upon innovations that are demonstrating impressive success and that have the potential to make substantial global impacts. One U.S. and one Japanese award recipients are selected each year through a rigorous process guided by a distinguished 40-person Innovation Advisory Council composed of venture capitalists, academic experts, and prominent business executives based in Japan and in San Francisco/Silicon Valley.